Hurricane Evo is a bagless upright vacuum which achieves an outstanding A++ rating for energy efficiency. 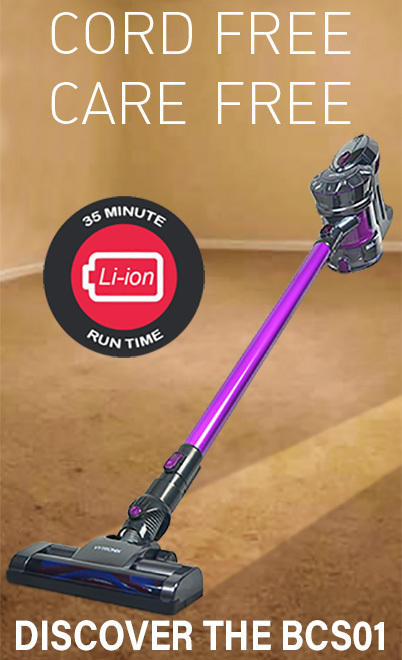 It also comes with plenty of thoughtful features to make light work of your cleaning, such as a powerful pets turbo brush and a long 4.5m stretch hose. With an unrivalled A++ rating for energy efficiency, Hurricane Evo is our most eco-friendly upright vacuum cleaner and could help save you money on your electricity bills. The long 4.5m stretch hose means you can reach right to the top of a 13 step staircase in one go, with no need to hold or balance the vacuum halfway up the stairs. Hurricane Evo features a generous sized 3L bin: the large capacity means you won’t have to interrupt your cleaning to empty it as often. Moreover, the bin has an easy release system that allows you to dispose of dust quickly and hygienically, without touching the dirt with your hands. Hurricane Evo features an extension tube, long crevice tool and a 2-in-1 upholstery tool / dusting brush that will help you to clean all over your home. The tools are stored on the vacuum, so they are always handy when you want to use them. Ideal for any homes with cats or dogs, this mini turbo brush helps give a deep clean to your carpets, sofas and curtains. Simply attach to the end of the extension tube and the suction causes the bristles to rotate and penetrate deeply into your carpets, releasing any stubborn embedded hairs.